From Montpellier : Take the A9 autoroute SW, direction Barcelona / Toulouse. From Carcassonne : Take the A61 autoroute east, direction Barcelona / Montpellier. From Girona/Catalonia: Follow signs to France, then on the A9 autoroute, direction Montpellier / Toulouse. From Perpignan : Take the A9 autoroute direction north, Montpellier / Toulouse. Ventenac is located 15 km NW of Narbonne. 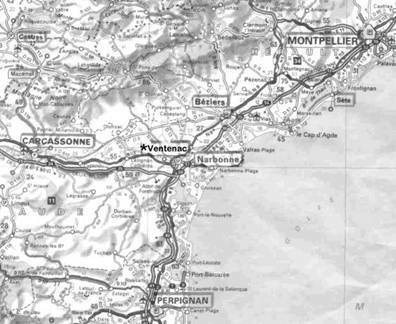 From Montpellier/Girona/Perpignan : Leave at exit 38 (Narbonne Sud), take the bypass N9 to the south and west of Narbonne, direction Lézignan – Corbières / Carcassonne, then join the N113. Turn right at the lights as you enter Villedaigne, follow signs to Canet d’Aude. You’ll be on the D11 going west. After about 1 km, turn right to Canet. Go through Canet, over the Aude, and you’ll arrive at a T-junction with the east-west road running along the south side of the Canal du Midi. From Carcassonne : Leave the A61 at exit 25 (Lézignan – Corbières), and go through Lézignan, following signs which take you to the N113, direction east (Narbonne). After about 5 km turn left for Canet (it’s actually an exit on the right followed by an anticlockwise loop round to the north). Go through Canet, over the Aude, and you’ll arrive at a T-junction with the east-west road running along the south side of the Canal du Midi. Alternative route via Béziers from Montpellier : This route is shorter and more pleasant, but about the same duration. Leave the A9 at exit 36 (Béziers Ouest), and follow signs to St Pons on the D64. Ignore the turn-off for Narbonne after 4 km and carry on another 1.5 km, where there is a slip-road to the D11 for Montady and Capestang. Drive west past these towns for about 30 km. The road is relabelled the D5 in Aude. 500 m after Cabezac on the Cesse (see map above) turn left at the big roundabout (dir. St. Marcel and Ginestas), fork right after 400 m (D26), traverse Ginestas, and approach Ventenac from the north. 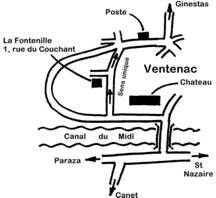 Ventenac : From the south, cross the canal, turn left past the Château, then right into Rue du Port. This is a one-way street running uphill (Sens unique on map to left). 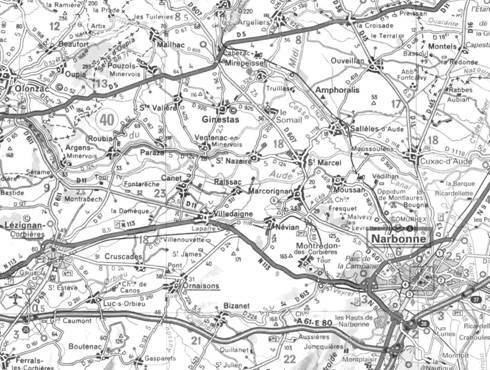 From the north, follow Toutes Directions, pass La Poste, loop clockwise around Rue Neuve to the canalside, and enter Rue du Port from the south. Rue du Couchant is the little lane towards the top of the hill. Our white iron gates are at the corner.